he actually joined us back in February 2010 - I can't believe it's been 2 ½ years! - to talk about the discovery of a factor that keeps nerve cells alive when they're damaged by a stroke or by injury. So thank you ever so much for joining us again. Before we go on to look at the latest developments on your work, today, we're talking about ageing. What does this nerve degeneration process have to do with ageing? Michael - So, in answer to one of your earlier questions, loss of nerves and the white matter tracts in our brains is certainly something that is taking place in your age group and even in people in their 20s. We don't really notice the effects of that until at least middle age because we are born with more than enough connections in our brains to compensate for that. But it is an on-going process. It happens throughout adult life and certainly, when you get into older age, then this can start to have a very significant effect on cognitive performance, and predispose to age-related disease. So, these are two very important reasons to understand this process. Ben - Do we know why we actually lose these? Are they only the result of injury or accident, or do we naturally lose some in the same way that earlier, we were hearing about senescent cells, which are cells that switch off and stop dividing after a certain time? Do we see the same thing in nerve cells? Michael - We're certainly naturally losing them all the time and the exact reason for that, we don't know. That really is part of what my group now aims to find out. So, we've worked for a very long time on mechanisms that affect the survival of our nerves after injury and in certain types of neurodegenerative disease. And ageing if you like, is a big new growth area in biomedical science. If you like, we're catching up with the pensions industry and the health service in realising that this is a very important issue to deal with. And so, many scientists now are asking, what can they do in the areas that they have already specialised in that can be related ageing and how can they bring some understanding of the mechanisms in that area. Ben - Now, when you joined us 2 ½ years ago, it was to talk about a protein that appeared to preserve these nerve cells. Could you just take us to how that works again? Michael - Yes, many proteins need to be carried along our nerves to keep the more extreme ends of those nerves alive and functioning. And among those many proteins, we identified one that was a limiting factor for the survival of the distal nerves or axons. We were able to do that because there is a particular spontaneous genetic mutation in mice - a harmless mutation that enables those nerve cells to survive for longer and we understood how that was working. Essentially, it was compensating for the loss of a normal protein in those nerves when they are injured. Ben - So, the idea is that if you had a stroke for example, you would be able to administer some of this protein and that would help to keep those nerves ticking over until you could then restore normal function through surgical intervention or whatever it may be. Michael - Yes, so either to administer the protein or to administer a drug for example which wold boost the activity or block the activity of a related protein and thereby, alter the outcome of the whole pathway. Ben - So, does it suggest that actually, tweaking these genes or taking this drug could also prevent the age-related decline and not just the stroke or injury-related decline? Michael - Well, that's really what we now aim to find out. One important point about research into ageing, it is inevitably a very slow process because ageing itself is very slow. We might think in terms of an individual research project which is typically funded for 3 years. If you're working in mice which live for 2 years for example, that's a significant part of that research project. So it does take inevitably a certain amount of time to do, and actually, one direction that we are heading now is to ask, what happens to this protein during normal ageing and is that one of the key determinants of this age-related axon loss? Ben - Again, when you joined us last time, this was all being done in the dish. It was cell culture, you were looking at. You just mentioned mice. Are we seeing a genuine activity of this protein in mice as well as in cell culture? Michael - Yes, so this is unpublished work. It's very important that the work goes through a peer review by other scientists before we announce the full results, but the early indications are looking to us quite clear that what we saw in the dish, in culture situations is indeed the case in mice, yes. Ben - Now, cells do have a natural way of dying off. This is apoptosis or programmed cell death. It's very important for avoiding tumours and so on. Are we increasing risks by keeping cells alive that wanted to degenerate, to no longer be alive? Michael - Well, this is a very interesting question. I think when I do a seminar to other scientists, I think one of the most frequently asked questions at the end is, how did we evolve a process through which we can rapidly lose our nerves after an injury? What could possibly be the advantage of that? And yes, that's certainly something we aim to get to the bottom of. One of the possible reasons for that is that if there is on-going loss of axons within our nerves during ageing, and within our brains, that has to happen in a very controlled way. If it gets out of control, there is a serious risk of it damaging the neighbouring axons within the nerves. It can be many thousands of axons within a nerve. If one dies, you want to limit the damage to that one axon and not to take out its neighbours as well. Ben - Now, we've been talking about cognitive decline today, so I think we may be thinking mainly about nerves in the brain which is of course just a mess of nerves and nerve connections. But presumably, this will all apply for the nerves that have incredibly long axons as well as the nerves that run down the spine, and run down into our extremities. It's not solely associated with the brain. Michael - Yes. For a science which essentially only has to be observational, our understanding of age-related axon loss is really quite basic at the moment, the international scientific understanding. That's an area that, as a very first step, we need to get a lot more information about which areas of the brain and the rest of the nervous system are losing axons and neurons more rapidly. And when that happens, many axons in the brain are very highly branched when you come to their extreme terminals. There are some that can have upwards of 100,000 branches at the end. Now, there are some very preliminary, very early stages of information that much about loss occurs in reduction of the number of branches rather than a loss of the main axon trunk itself. But that's only been shown in some very specific areas of the brain and we need to understand much more about whether that's a general phenomenon throughout the brain or whether it's only in some areas. Ben - And just finally, only fairly recently have we seen good solid evidence for neurogenesis, the idea that throughout our lives, we're still forming new nerve cells. Is this protein related? Are you likely to be able to encourage more new nerve growth or is this purely protecting the existing ones? Michael - Yes, the understanding of neurogenesis has been one of the big stories over the last 10 years or so in neuroscience. 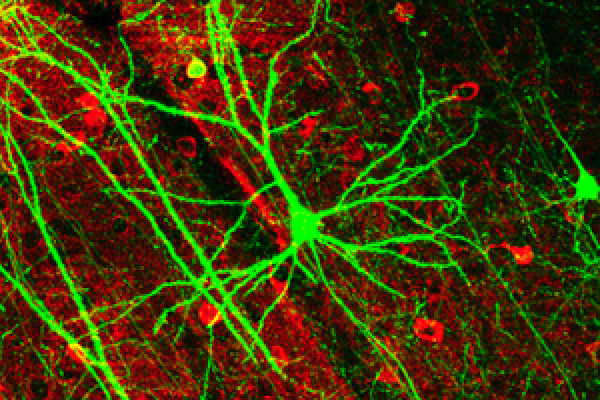 What we don't know yet is whether those newly born neurons contribute to long projections around the brain or whether they influence only the very local environment in certain areas of the brain. So, whether this protein is actually involved in any growth of axons by those neurons, it's really still unknown at the moment. Petri Dish That Goes "Ouch"